Runners have hit out at the "failure of the race organisers to provide adequate water supplies" during the Edinburgh Marathon at the weekend. Competitors said some of the water stations along the 26.2 mile route to Musselburgh racecourse completely dried up during Sunday's race. It is understood there was no water at about five of the stations. One participant said "people were dropping like flies" and another said it was "disgraceful". There was no one available for comment on behalf of the Albert Bartlett Edinburgh Marathon. Hundreds of thousands of spectators lined the pavements to watch the runners, while more cheered them on at the finishing line. Temperatures of up to 22C took their toll. It is understood 10 people had to be taken to hospital after collapsing due to heat-related problems and 160 were treated by medical staff at the scene. 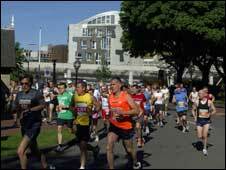 A total of 8,260 runners completed the marathon, out of 13,104 entrants, with a further 4,060 completing the relay race. Jan Fulton, who competed in the race told BBC Scotland news website: "There was no water at three of the stations for six miles between 15 and 21 miles. "People were dropping like flies in the heat, it's through woods and back from the coast. "Members of the public were brilliant and running out of their houses with glasses of water and hosing runners down, but this was after several miles with no water along desolate country roads in the heat. It is outrageous that they ran out of water." Peter Davis, who was watching his wife compete, said: "The failure of the race organisers to provide adequate water supplies was disgraceful. "There could have been a major public safety problem as exhausted runners fell victim to the heat." A 30-year-old runner from Edinburgh who completed eight miles in the relay race said she had no water for the "entire stretch" of her run.